Commercial boats under construction at Osprey’s Stoke factory in Nelson. 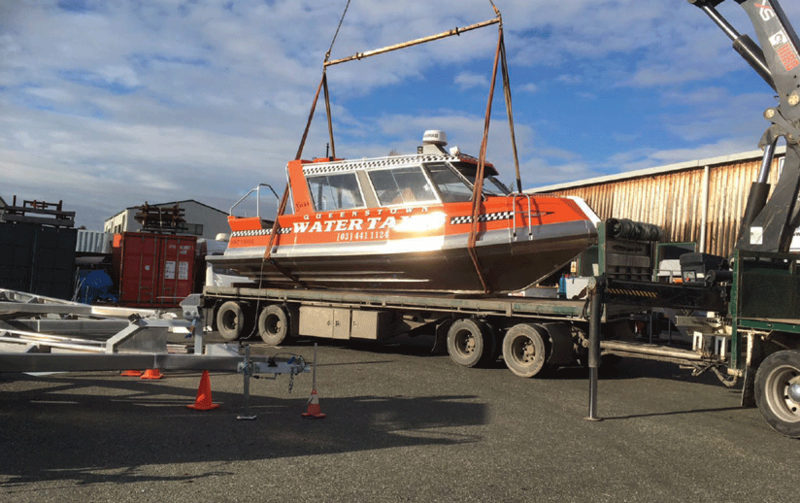 Riding the crest of a wave with a steady stream of orders flowing in for new boats, Nelson boat manufacturer Osprey Boats Ltd is one of New Zealand’s proud success stories. Skippered by founder Lloyd Elliott for nearly three decades, Osprey Boats started life as Alloyd Engineering Ltd – a one man operation manufacturing anything from apple coring and slicing machines to the first hydraulically driven re-seeding machine for mussel farming. Initially working from a 6m x 6m garage at his home whilst raising two children as a solo parent, Lloyd soon needed to employ staff to keep up with the demand. While involved in the mussel industry, requests were made by farmers to produce soft riding stable boats to service the aquaculture farms in Marlborough Sounds. Experienced boat building staff were employed, new designs, jigs and patterns developed and a marketing contract with a prominent marine outlet was the birth of the Osprey era. The second boat built was the beginning of a long relationship with Abel Tasman Aquataxi which is still strong to this day. Now with 30 different models and options to choose from, Osprey aluminium pontoon boats have been purchased by such diverse groups as conservation departments, harbour boards and adventure tourism companies, both within New Zealand and abroad and have become increasingly popular in the recreational market. Operating out of Stoke, about 5 kilometres from Nelson City Centre, Osprey Boats typicaly custom manufactures between 25 and 40 boats each year. Osprey aluminium pontoon boats have been purchased by such diverse groups as conservation departments, harbour boards and adventure tourism companies. Lloyd believes the continued demand for the boats comes down to their reputation for providing a very stable, comfortable ride on the water. Many customers tell Lloyd they have been on a ride on an Osprey Boat in the Abel Tasman or Stewart Island and just want one. “A young lady from Dunedin was exploring options to set up a nature watch company and had heard a lot about Osprey Boats. She visited Stewart Island where Rakiura Charters operate two Osprey hardtops, site seeing, taxi & fishing charters. She also went to Queenstown and travelled on Ta Kara as well as contacting Abel Tasman Aqua Taxi. And they are customizable. Lloyd says that virtually every boat leaving the workshop has been customized to meet the owner’s needs. “We start off with the basic design which is the hull, cabin or sides – we don’t compromise on the buoyancy or safety aspect. Innovation is another key to the business’ success and Lloyd says that over the years the boats design has been adapted, modified, evolved and refined so that everything gets better. Lloyd is also a positive thinker and welcomes ideas from others.